Everything you need packed conveniently in a 23 x 11 x 11" tool/storage box. High-impact copolymer box will not dent nor rust, and is resistant to most chemicals. 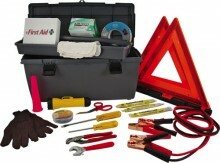 Click the button below to add the Jensen Tools JTK-111 Highway Safety Kit to your wish list. Jensen Tools 9W Safety Wire Twister, Manual, 6"